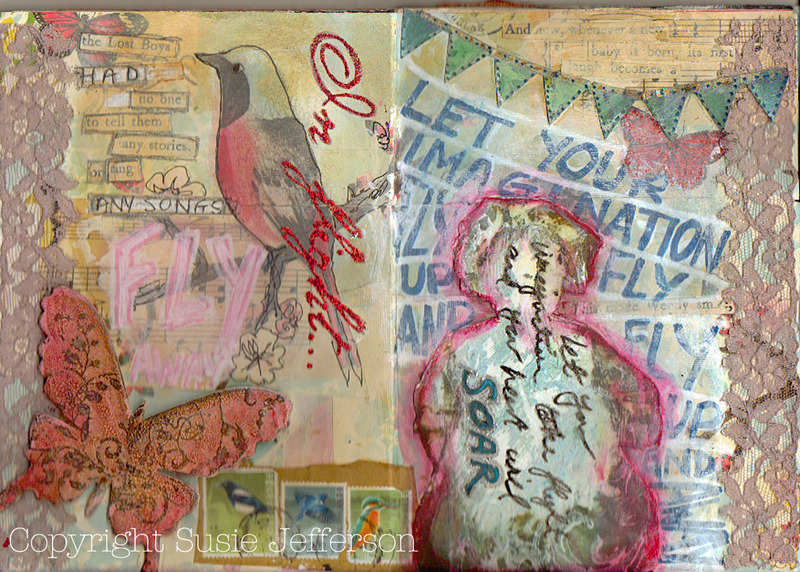 Let Your Imagination Fly - this is in my Life&Loves journal. 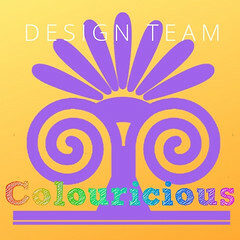 I have a feeling I'll probably do some more tinkering some time down the line... when is 'finished' really FINISHED, lol? Here, I've used vintage lace on both page edges (dipped in tea to 'antique' it a little) and the In Flight phrase is a stamp image by Tattered Angels, from their butterfly scrapbooking set. I've used Stickles in Ruby Slippers over the top of the letters - lush! The phrases are vintage text cut from an old copy of Peter Pan, gesso over the top. I've drawn back into the bird with a fine pen, and doodled in some flowers etc. 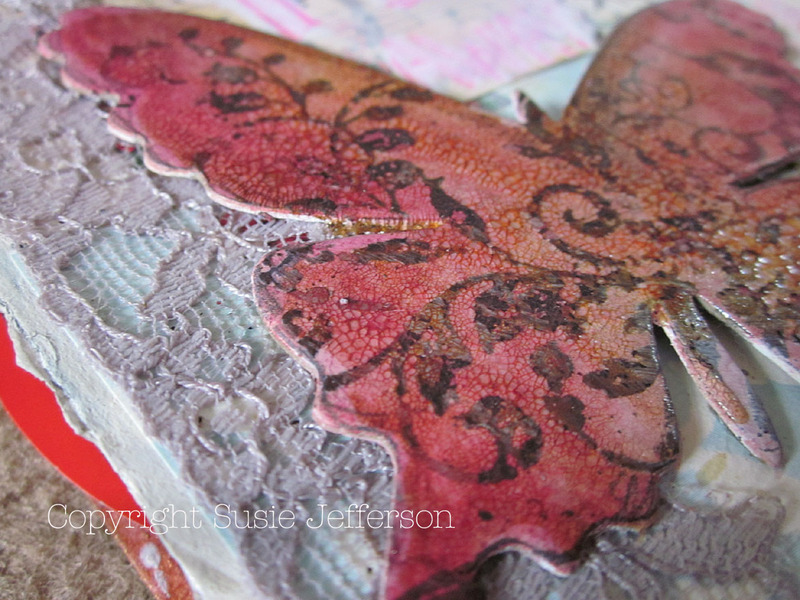 The chipboard butterfly was stamped and embossed, then sprayed, then I added more ink, some gesso, a thick coat of Distress Crackle in Rock Candy - and finally some Distress Ink (Mahogany) worked into the cracks when dry. 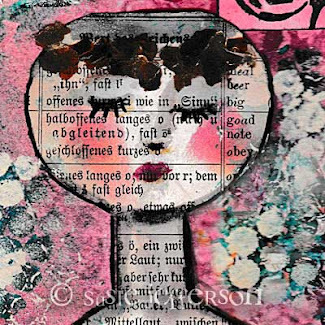 The figure is a photograph of a little girl, cut out of a magazine. Which I then didn't like. So I used baby wipes alternated with Duraglit to remove the colour off the image, added a watered-down coat of gesso and stamped over the top, then sanded back and added some acrylic paint. Once it was all dry, I drew around the image with a paint pen. Next, I used a waterbrush to flood the paint, blending out the colour to form a sort of halo around the image. Finally I added all the lettering by hand. Hated the lettering in the background as it was too dominant, so out came the gesso and then the acrylic (white) added with a sponge and partially blotted off. 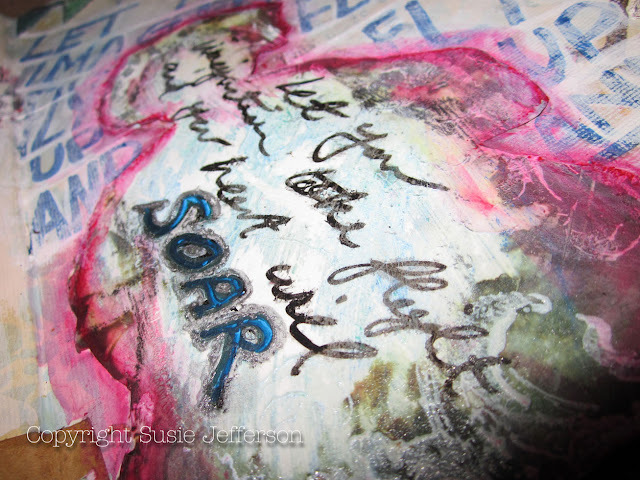 For the word 'soar' I used a metallic pen in blue, then drew a border around to finish. I follow Eduardo Recife since a long time but thank you for the links !!! So nice of you !! Great to see the close ups from your work. Djeez what a multy talent you have !!! This looks so pretty. I am really loving your journal pages.